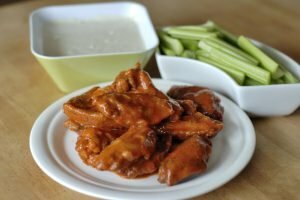 I’ve posted recipes for other, similar hot wings before, but I decided that another post was in order now that I’ve perfected it and in honor of the approaching Super Bowl. 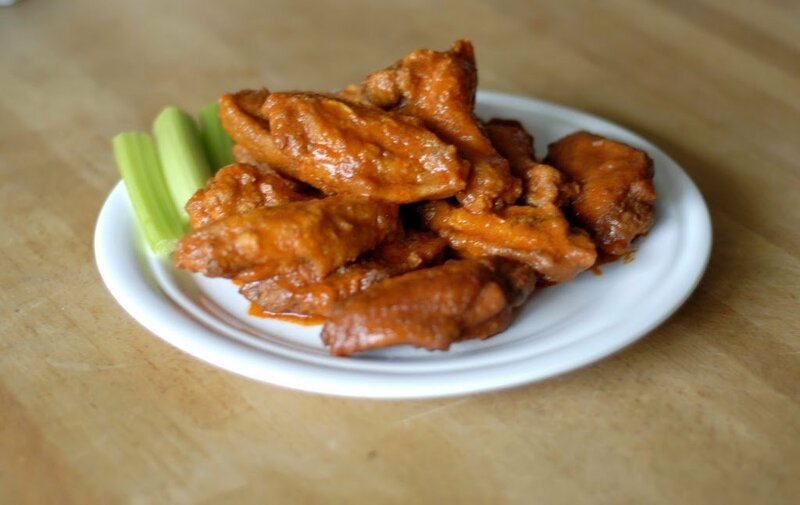 These hot wings have shown themselves at several football watch parties and gotten favorable feedback. And when I say favorable feedback, I mean boys chowing on them silently while their eyes are glued to the TV screen. 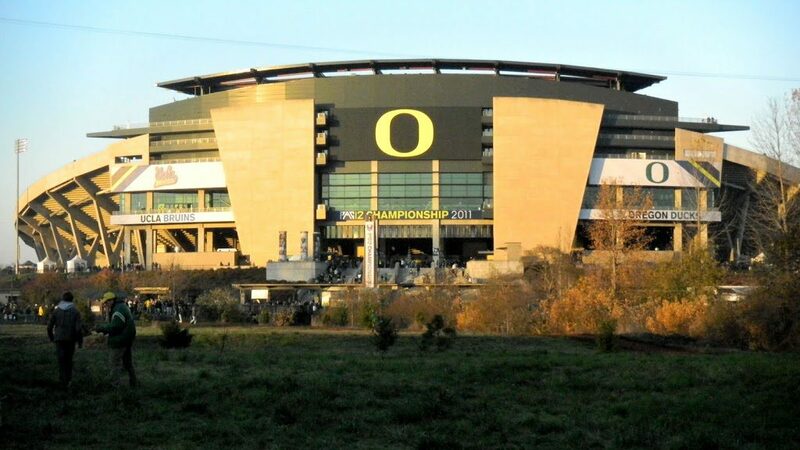 Silent men watching football is a rare, rare thing. So make these hot wings and enjoy the brief moment of silence. Unfortunately, they don’t last long. Before I start cooking the wings, I prepare the “holy-crap-my-whole-face-is-tingling-HELP!” cooling devices: celery and blue cheese dip. Just chop up some celery hearts into sticks. And mix them together. In the same bowl I plan to serve the dip in. And that’s it. You could add garlic or something like that, but this tastes great on it’s own. Something I’ve learned to be absolutely essential with these wings are which cut you use. I don’t use giant, real wings. I don’t use drummettes. 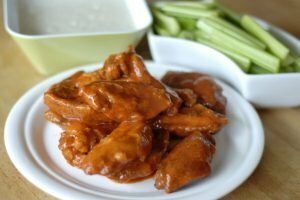 I use “party wings” or “wingettes”- they’re really easy to eat but still wings. And they look like this. 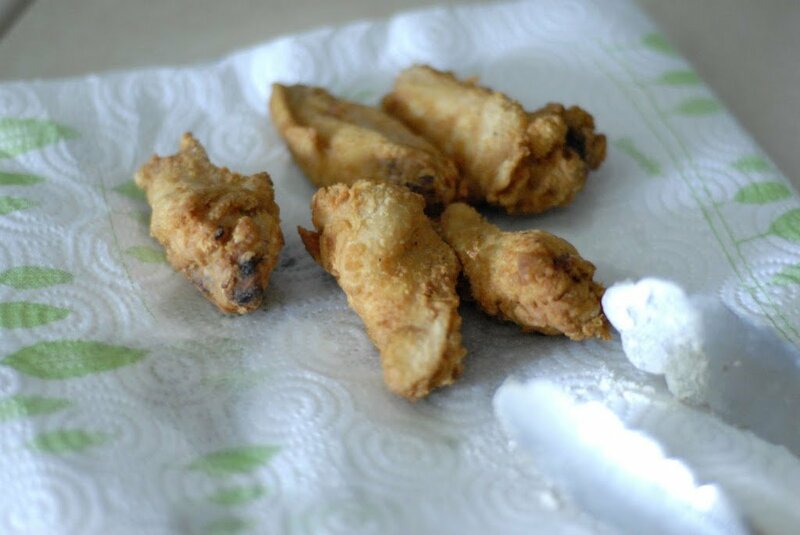 Before frying, I coat the wings in a seasoned flour. 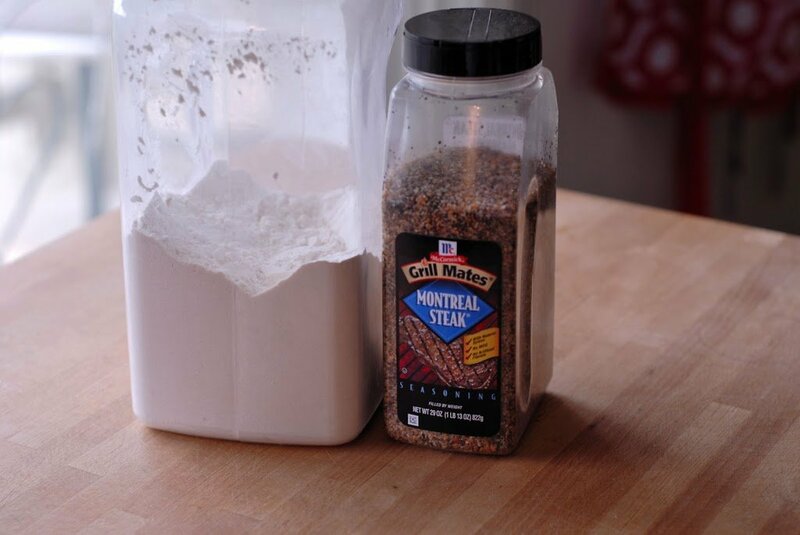 I use flour and Montreal Steak Seasoning and throw ’em together in a gallon sized Ziploc bag. Add the chicken to the bag and shake it around to coat. Now heat the oil. I will admit, I don’t use a thermometer when I do this- I just fly by the seat of my pants. I probably should, but eyeballing it has worked thus far! However, AllRecipes tells me the oil should be 325 degrees. When it’s hot, drop the chicken in the oil in batches. I did five at a time. While the chicken is frying, we make the sauce! My sauce is very simple, and that’s part of it’s beauty. Frank’s Red Hot, hot sauce, and butter. For the hot sauce, you can use Tabasco or something else- this just needs to be potent. I really recommend Frank’s Red Hot here. 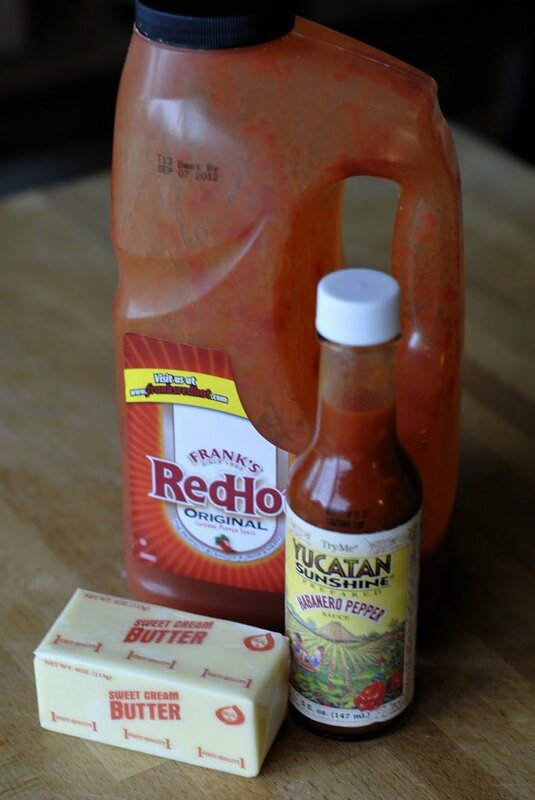 You could use something like Tapatio… but Frank’s Red Hot really does the job well. 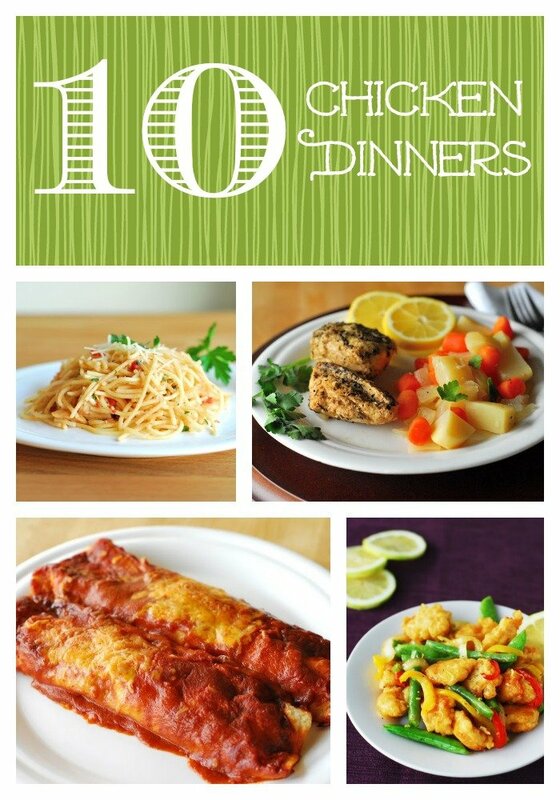 Pour it into a medium size sauce pan and add the butter and a few dashes of hot sauce. Add 3 or 4 dashes, give it a taste, and adjust as necessary. This stuff is potent, so be careful. Heat until the butter has melted, then keep it on low to keep it warm until the chicken is ready. Now back to the chicken. 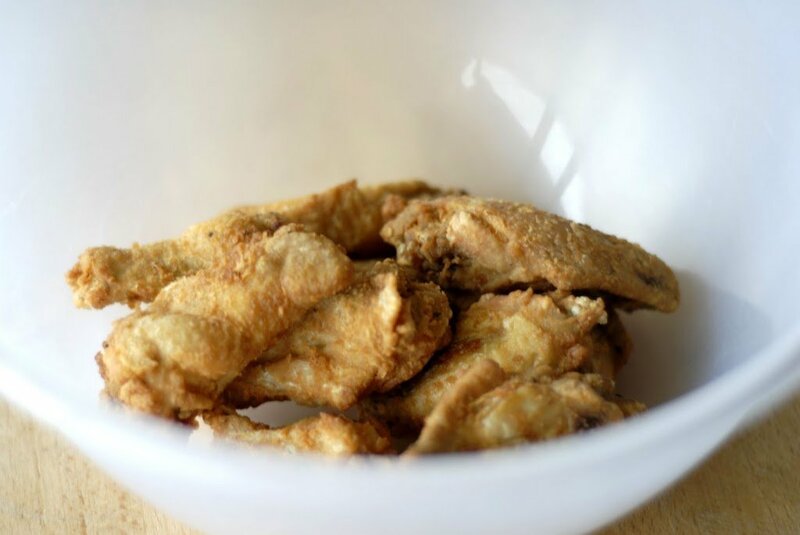 When the wings are golden brown, remove them to a paper towel lined plate. When all the chicken is done frying, put the pieces in a large bowl. 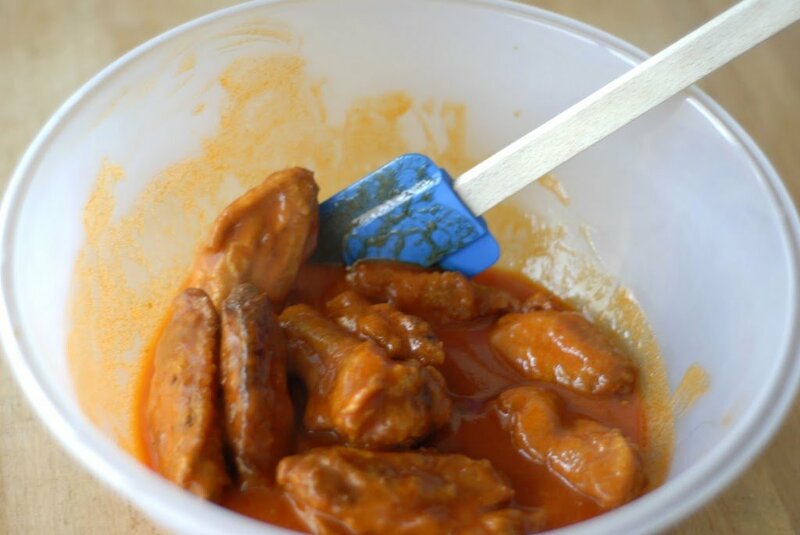 Pour the hot sauce over the chicken and toss it around with a spatula. Serve with the celery sticks and blue cheese dip. 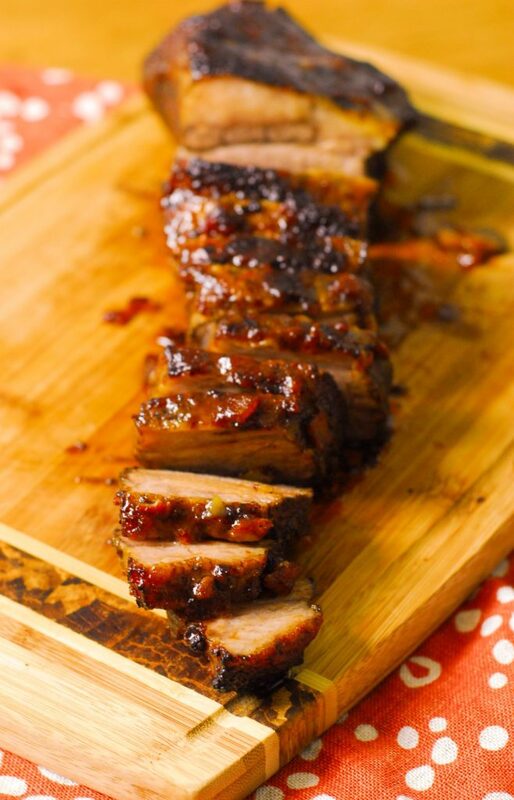 And watch screaming mouths fall silent as football watchers become too busy stuffing their mouths and covering their faces and hands in spicy, buttery goodness. Combine flour and seasoned salt in a gallon sized Ziploc bag. Add the chicken to the bag and toss to coat. Fill a medium sized saucepan about two inches deep with oil. Heat until oil reaches 325 degrees. Add the chicken in batches to the oil, being careful not to crowd the pan. Fry until wings are golden brown and remove to a paper towel lined plate. While the chicken is frying, combine the sauce, butter, and tabasco in a saucepan. Heat on medium-low heat until butter is melted, then heat on low to keep the sauce warm until the chicken is ready. When all the chicken has been fried, place chicken in a large bowl. 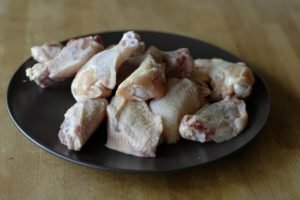 Pour sauce over the chicken and toss to coat. 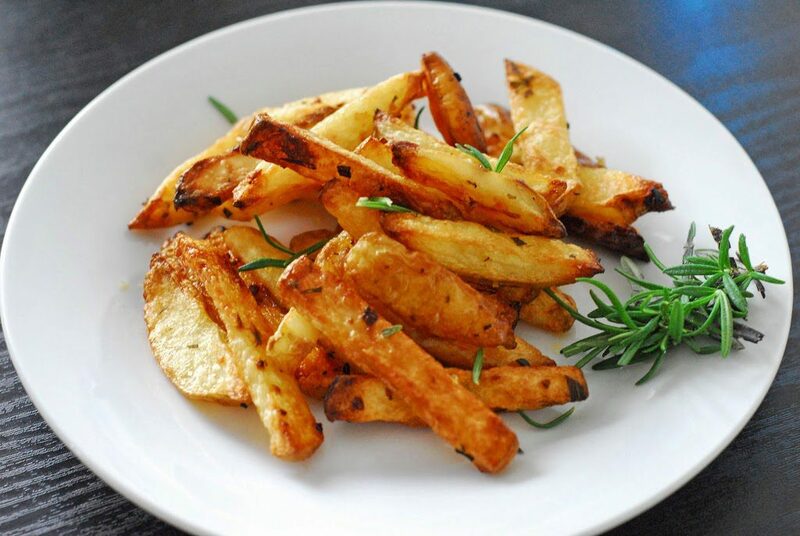 Serve with celery sticks and blue cheese dressing. Combine the ranch and blue cheese. 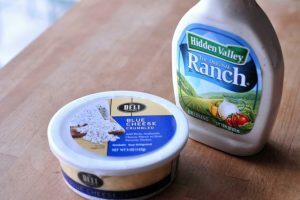 Use a fork to crush and stir the blue cheese into the ranch. 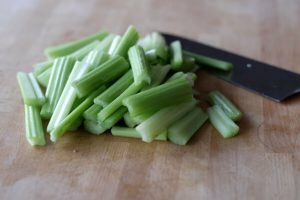 Serve with celery.